On the Path to SunShot is a series of eight reports that examines the lessons learned in the first five years of the initiative and the challenges and opportunities the industry faces in the final five. It identifies the key research, development and market opportunities that can help ensure that solar energy technologies are widely affordable and available to more American homes and businesses. Finally, it serves as a starting point for the next phase of SunShot, as it looks forward to a future with even lower cost and widespread solar energy. On the Path to SunShot reports were produced through a collaborative effort by researchers at four national laboratories: the National Renewable Energy Laboratory, Lawrence Berkeley National Laboratory, Sandia National Laboratories, and Argonne National Laboratory. Achieving the 2020 goals will require focused efforts across technology development, systems integration, and the marketplace. As the proportion of solar energy on the grid reaches unprecedented levels, the systems that manage U.S. electricity generation, transmission, distribution, and consumption must evolve to maintain grid reliability and cost-effective solar integration. On the Path to SunShot demonstrates that the technologies and strategies used to facilitate this evolution will affect system-wide costs and improve the value of solar energy, which will be enabled by a total installed cost of solar energy systems reaching $.06 per kilowatt-hour. Grid flexibility options and smart inverters, among other technologies, could enable solar penetration levels at 25% and beyond. Continued advances in science and technology will play a critical role in meeting cost reduction targets and offer potential pathways to further reduce costs. Further lowering solar costs will enable the development of solar energy systems with higher value at higher levels of penetration. As the deployment of photovoltaics (PV) increases, it is possible that utility system operators would need to reduce PV output to maintain the crucial balance between electric supply and demand. As a result, PV’s value and cost competitiveness would degrade. This loss of value could be stopped by increasing system flexibility through enhanced control of variable-generation resources, added energy storage, and motivating electricity consumers to shift consumption to lower-demand periods. Widespread use of advanced inverters and voltage management solutions could double the electricity-distribution system’s hosting capacity for distributed PV at low costs. Improvement of interconnection processes, associated standards and codes, and compensation mechanisms is critical to facilitating distributed PV deployment so they embrace PV’s contributions to system-wide operations. Additional reductions in the levelized cost of electricity of 40%–50% will be required to reach the SunShot Initiative’s targets. Understanding the tradeoffs between installed prices and other PV system characteristics, such as module efficiency, module degradation rate, and system lifetime, are vital. The ability of concentrating solar power (CSP) to use thermal energy storage—and thus provide continuous power for long periods when the sun is not shining—could give CSP a vital role in evolving electricity systems. Developing enhanced thermal energy storage is critical because its flexibility increases the electricity system’s ability to balance supply and demand over multiple time scales, which is increasingly important as more variable-generation renewable energy is added to the system. Improvements to standard PV modules have produced deep cost reductions, but the returns on such incremental improvements appear to be diminishing. More dramatic innovations in module design and manufacturing are required for cost reductions to continue. This need for innovation could benefit U.S. PV and CSP manufacturers, as our country is a global leader in PV and CSP R&D and patent production. The U.S. has also been rated one of the world’s most competitive and innovative countries, as well as one of the best locations for PV manufacturing. Financial innovations could cut the cost of solar energy to customers and businesses by 30%–60%. Development of a larger, more mature U.S. solar industry will likely increase financial transparency and investor confidence, enabling simpler, lower-cost financing methods. Utility-scale solar might be financed more like conventional generation assets are today, non-residential solar might be financed more like a new roof, and residential solar might be financed more like an expensive appliance. The success of net energy metering has raised concerns about the potential for higher electricity rates and cost-shifting to non-solar customers, reduced utility shareholder profitability, reduced utility earnings opportunities, and inefficient resource allocation. A new analysis estimates that eliminating net energy metering nationwide would cut cumulative distributed PV deployment by 20% in 2050, which is stimulating the development of alternative reform strategies that address concerns about distributed PV compensation. Quantifying the environmental and public health impacts of solar energy is essential to understanding the true costs and benefits of solar technologies. It is estimated that these benefits could add approximately 3.5 cents per kilowatt-hour to the value of solar energy. 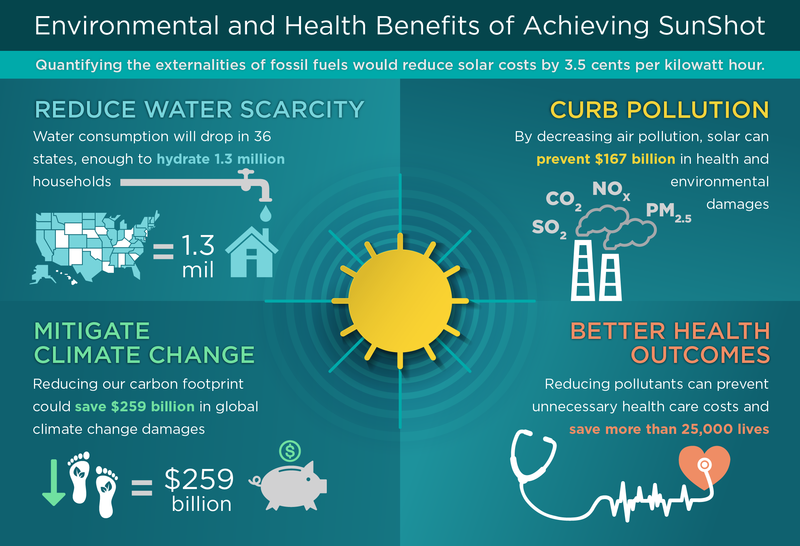 Compared with fossil fuel generators, PV and CSP produce far lower lifecycle levels of greenhouse gas emissions and harmful pollutants, and could produce $167 billion in savings from lower future health and environmental damages while also preventing 25,000–59,000 premature deaths.